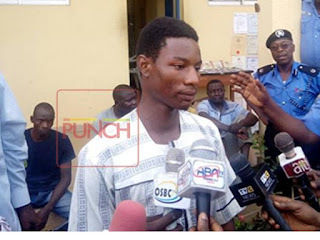 A final year student of Accounting at the Osun State University, Yemi Olaniyan, whose family said he disappeared from the Ojodu Police Station in Lagos State, has come out of hiding. The student was presented to journalists by the Commissioner of Police in Osun State, Mr. Fimihan Adeoye, at the police headquarters in Osogbo on Wednesday. Olaniyan resurfaced two weeks after he was declared missing by his family. He claimed to have left Osogbo for Lagos on February 28, ostensibly to submit an application for Industrial Training with the Institute of Chartered Accountants of Nigeria in Yaba, Lagos. Olaniyan said he informed a female acquaintance simply called Oyin that he would spend the night at Ojodu Police Station in Lagos later that day, but he confessed to have later changed his mind, claiming he spent the night at a shopping complex, from where he allegedly left for Ilorin the following morning. The CP said the boy turned himself in to the Department of State Services and the operatives of the DSS brought him to the Police.